Made with nothing but a piece of brass, two taps, a drill press, a file, a hacksaw, two aluminum castings, a spring, a ball bearing, three set screws, and a piece of drill rod. Well, it's still simpler than trying to cast the threads in. Ball detent pressure is adjusted by the setscrew in the handle. The setscrew pushes on a spring which pushes on a ball bearing which pushes on the apron. The apron has two dimples in it, one for the closed position, one for open. The dimple for open should be large, and the dimple for closed should be small. 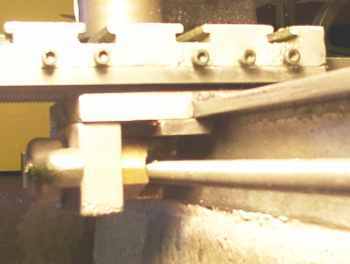 When the split nut hits the threading stop (not shown) it will turn counter-clockwise, the ball will jump over the crest between the two dimples, and the split nut will spring open. If the dimples were both small the splitnut would try to stay closed and go "click click click" until you opened it completely. Based on "PukiWiki" 1.3 by yu-ji. Powered by PHP 5.3.2-1ubuntu4.5. HTML convert time: 0.051 sec.